TAMMY: It's time to hear from an artist who's been making music for many decades and has made Worcestershire her home. She's back with a new album called “In The Court Of The Crimson Queen”. We welcome back Toyah! TOYAH: (on the phone) It's good to be back! How are you today? TAMMY: I'm alright. How are you? TOYAH: I remember forty was considered middle age when I was a child and I feel fantastic. I'm actually enjoying life now more than ever before. I tell young people I see you've really got this to look forward to. Don't let anybody put it down, this is great! TAMMY: Your glass is half full and I like that, it's infectious already. The new album “In The Court Of The Crimson Queen”. I love that. Described as revelatory and accomplished. Now the accomplished bit seems about right about someone who's been making music for so many years but the revelatory bit – do tell? TOYAH: Well, it's an interesting one really. Its a very happy “up” album, it contains a lot of joy within the music. And the lyrics – I'm a lyricist – so are spikey and I like to invert meanings. Songs like “Heal Ourselves”, which is about communities helping themselves to feel stronger and to bond more, I kind of take on the role of protector. You don't expect a woman to do that, even in these days you don't expect a woman to offer protection in a masculine way. An in a song like “Bad Man” I'm talking about – we so often put people into cliched images, cliched accusations where actually, deep beneath the skin, they're pussycats. So I like to invert meanings and I like to throw away stereotypes. TOYAH: And it took me a year to explain to him that those four bars are so magical that they have to be the opening song on this album. And we made it happen and I still believe after days and days of radio promo (Tammy laughs) that “Dance In A Hurricane” is the one song I want to be remembered for. TAMMY: It's so funny, everything you've just said – because I've got a couple of notes written down here and I'd written on this little scrap of paper that the 15 tracks on the album – looking at life and love and empowerment and wonderment and I'd put here “I guess it's fair to say you couldn't have made this album forty years ago”? 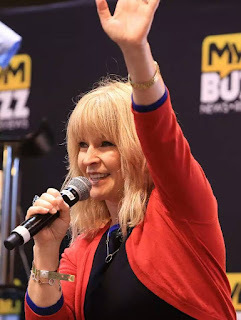 TOYAH: I find myself, in retrospect, able to say that I'm very lucky no one took an interested in me in the business and what I mean by that none of the megastar management wouldn't be interested in someone like me. TAMMY: Toyah, it's interesting isn't it, because we talked about kind of walking your own path and being yourself and having autonomy. Are you then defiantly walking your own path in 2019? How is life? 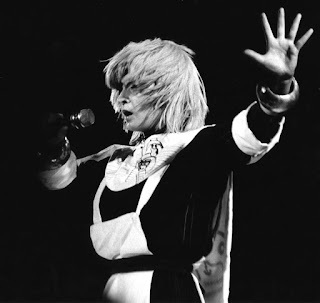 TOYAH: Well, it's busy, it's very busy and I would do anything to find a PA at this moment in time (they both laugh) because I do four shows a week and I get home and I live in your area and I'm in the office til six in the morning doing contracts for the band. It's very busy, I run a very successful business, which in being Toyah Willcox. 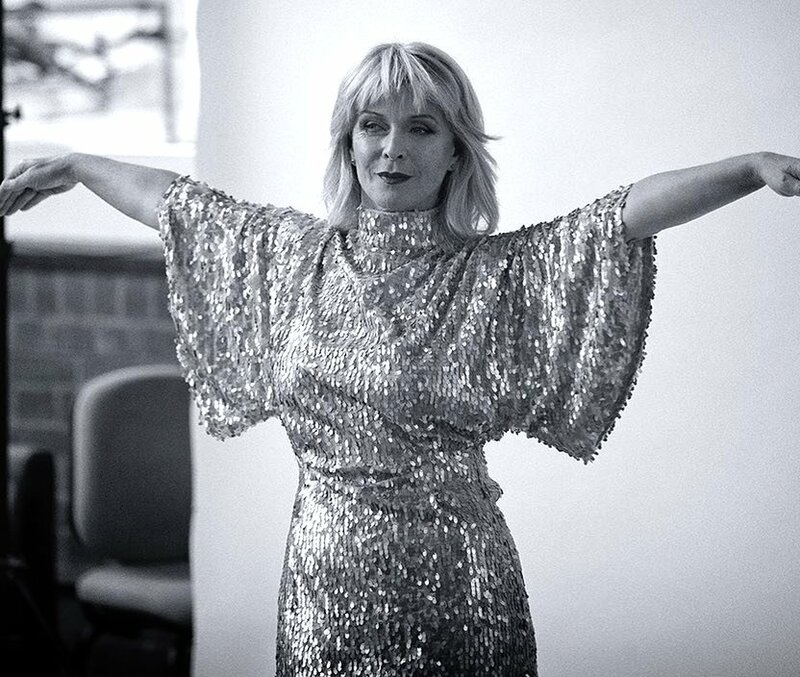 TOYAH: It's a very very lucky place to be, to be in show business and to be in it for 42 years. My husband, who's Robert Fripp, (below, with Toyah) says if you live long enough everyone falls in love with you again. There's definitely been yo-yo moments when it's been a huge struggle and you just keep going! TOYAH: We absolutely love it and there seems to be an invisible rule. We live on the High Street between two shops, I mean we couldn't be more visible but I think the community has made an invisible rule to let us have a normal life. TOYAH: We really love where we are. We feel that – it's obviously our home, we've been there for 17 years, but we feel that out of everything we do – and we both tour the world constantly, we want to go back to where we live. TAMMY: Isn't that great … Let's talk about another track on the album. How about “Sensational”. What's that about? TOYAH: And we live in a time when social media … it's so lacking in intelligence and imagination to be critical. Negativity is easy, that's why it flows. I think it takes a strong person to complement another. You come across young girls who have no confidence but you also come across boys who've no confidence and I've seen more eating disorders for example in boys than I have in girls. TAMMY: Do you know, the essence of Toyah – we should bottle it and all take a sip every day. I love that! TAMMY: She is a business woman after all! (both laughs) Toyah, we need to reminiscence a little bit because you grew up – is it in King's Heath in Birmingham? TAMMY: Not far from where I grew up in the 60's, the 70's. Interesting time politically and socially. 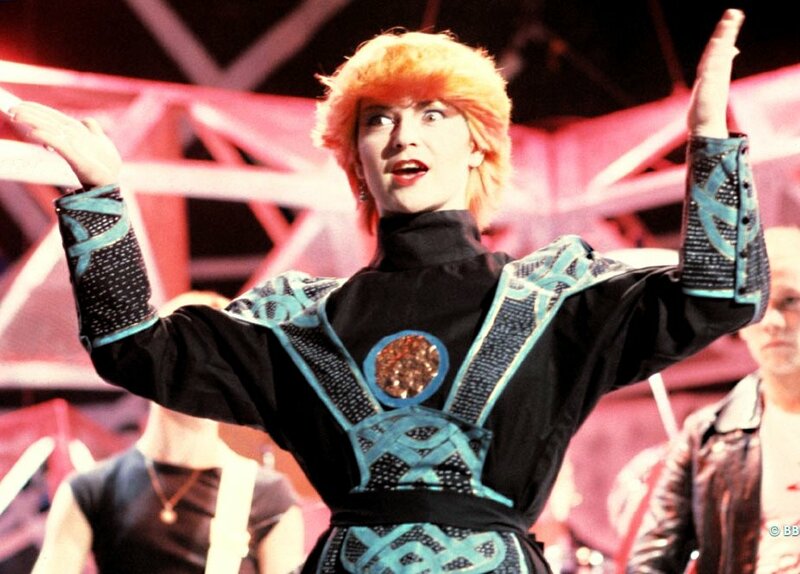 What were your aspirations and what was the young Toyah like? What did you want to do? TAMMY: Oh well, there you go! TAMMY: That's amazing, isn't it? TAMMY: Interestingly I did read a story and you can correct me if I'm wrong, because there's loads of rubbish out there … At school, didn't you set off an alarm clock during a visit to the school by a certain PM? TAMMY: My! That's such a brilliant story! I absolutely love that! I love it! Because of course we know that you've always written songs that they kind of challenge and inspire and about being true to yourself . “I Want To Be Free” - I remember seeing that and thinking it's awesome, I love that! All the big hits that were in the charts, “It's A Mystery”, “Thunder In The Mountains” and so on. Where did young Toyah get that confidence and that courage to stand up and be counted? 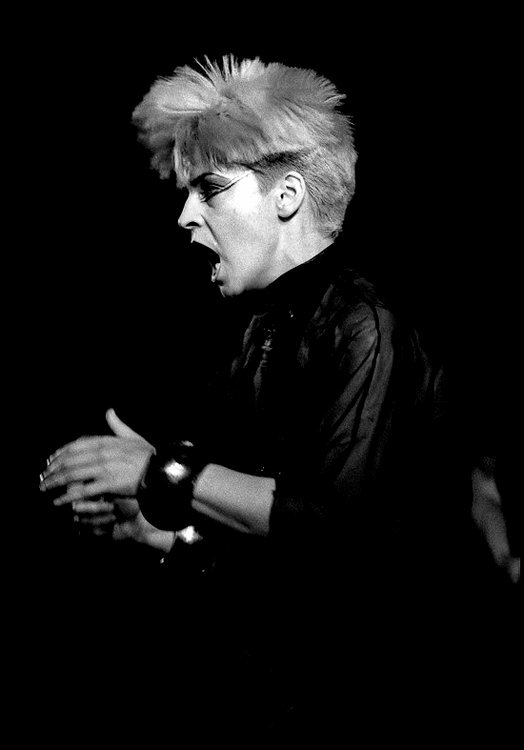 TOYAH: I think punk rock. Simple as that. I knew – because I'm not physically exceptional – I'm barely five foot tall and I wanted to be in an industry where you had people like Cher, ABBA, Farrah Fawcett-Majors, you know these beautiful tall elegant women. Feminine graceful women … Well, I am none of that! I was very independent image wise from the age of 14. I was a hair model in a big department store in Birmingham, did the big hair shows around the country, had coloured hair right before punk and I knew I was going to have to be different to be noticed. But I didn't have confidence and then I discovered punk and punk was very accepting of women. TOYAH: I loved that school! It was very rinky dink and I absolutely loved it, it was my happiest time. We were in a real theatre and for me to be in something that's real – (rather than) if you're on a film set or a TV studio – you absorb it and I loved being at the Old Rep Theatre. TAMMY: Wow! I love that. And loads of films including “Quadrophenia”, loads of stage plays and books and the music. If you look back down the road leading you to where you are now – would you change anything, would you have done anything differently, Toyah? TOYAH: Oh, that is such a good question! I would've acted on my moments of inspiration rather than thinking that they would always be available and what I mean by that you do have bursts of insight that are definitely meant to be acted on. TAMMY: Oh, is it?! Ooh! TAMMY: Hmm. Yeah, I think you're right as well. Talking of home, you know, we have two magnificent musicians living in one house … Is there any chance that the neighbours, as mush as they're being very cool about you being there and all of that – do they ever hear you having a little jam in the living room? No … or? (laughs) I'd love to live on your street – can you imagine! TOYAH: I'm studying music at the moment and I have a wonderful teacher called Chris Long, who the community will know because he's always doing concerts, a keyboard player. He's teaching me music theory and keyboards. He insists that I practice with somebody jamming along with me and I asked Robert to jam along with me and Robert was so unhelpful and so ungiving. TOYAH: So yeah, you might be able to hear us arguing about playing together (Tammy laughs) but actually playing together … no! 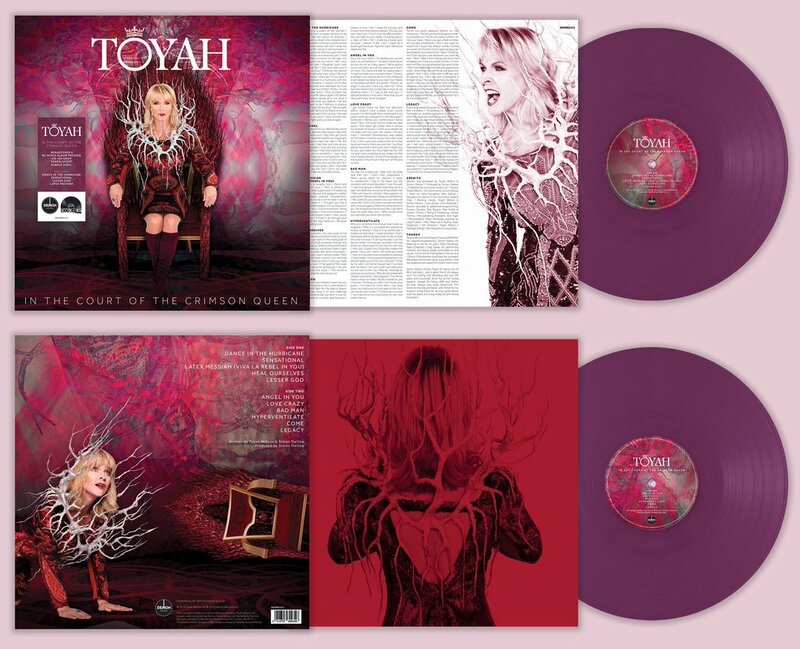 TAMMY: (laughs) “In The Court Of The Crimson Queen” is the new album from Toyah. You are touring – do you still get that buzz from being on the road all these years on? TAMMY: Whoa! Love that! If only that was possible! TAMMY: (laughs) And on that note – you can see Toyah at loads of festivals across the summer. The Mill in Birmingham on the 18th of October. Have a look at the website because all the stuff is there and you get your hands on this brilliant album “In The Court Of The Crimson Queen”. Toyah, it's been a joy! Thank you! TOYAH: Thank you so much, Tammy and it's good to talk to you and I can't wait to come home! MARK CARTER: Congratulations on the new album! I have been listening and I love it! It's a great sound. You must be very proud? TOYAH: I love it. Some people have described it as pure joy and is a joyous album and there's absolutely no point in me trying to be serious and adult. I do energy and I think this album has it and yes, I really love it. I've been living with some of these songs as long as ten years. Tracks like “Sensational”, which is being treated as a single at the moment. That was written in 2007 and it's been in my set, in my live touring for all that time and the audience know every single word to it. So I don't know if you know the story of what happened and why this album is being released? TOYAH: (laughs) I will! On my 60th birthday last year the fans downloaded me to number one in the charts and I was unsigned and it lead to many people saying "we can't give you radio play, you have to be a signed artist". So Demon Records picked the album up, we've added five new songs to the album. It's been one hell of a journey getting this into the shops and on the pre-order chart it went straight to number one and of course I've been touring this music for 12 years. MARK: An incredibly loyal following that you've had over the years as well? TOYAH: They're very loyal. I perform live a lot. Mainly in England, I do four shows a week throughout the year. I tour two shows constantly – one is the acoustic show which allows the older members of my audience to feel that they can relax and sit and listen to stories and music and then I have my really loud energetic rock band that tends to play on Saturday and Sundays (they both chuckle) That's when people can dance for 90 minutes. MARK: How fantastic! And “Dance In The Hurricane” is fabulous. It kind of sums up somebody walking through your path in life and that is, may I say, what you've done brilliantly over the years, isn't it? TOYAH: Well, thank you. “Dance In The Hurricane” I think for me will be my epitaph, it's what I want to be remembered for, it's that one song I feel as an artist, thank you, I know why I've done this for 40 years. We only completed the song in January. The whole album is just me and my co-writer Simon Darlow, who by the way wrote “Salve To The Rhythm” for Grace Jones. Simon and I started writing when I was 19 and he was 17, that's when we first met and that's how long our relationship has been as writers. MARK: Thank you. Bonnie Tyler was on the show the other day and she sounded like she is having the time of her life, she is into her sixties and absolutely loves it. She's got a new album out as well at the moment and you sound like this is the best time in your life as well? 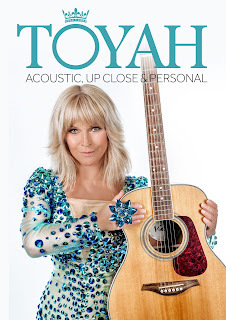 TOYAH: I highly recommended it! No one tells young people they've got something to look forward to (laughs) It's fabulous! 30 was hard – my thirties were terribly difficult because you're biologically dealing with everyone asking when are you going to have babies, which I found very very infuriating. MARK: Good for you. I tell you what, Leslie Ash was in Brighton this week because they're launching this big Quad40 thing, celebrating 40 years of “Quadrophenia”. Can you believe – 40 years?! TOYAH: Oh yeah! Tell me about it! MARK: Love it! Now, how much of your career, I'm intrigued by this - how much of your career in the early days did you manage to shape or was it shaped for you? TOYAH: I was pretty much the driving force. There's two blades to my career – I'm not the kind of artist that the mega managers want to manage. I'm just not in that league but also people realise I'm very good at managing myself, which is what I do. I'm very quirky, I don't fit in any mold therefore I think my lack of international success has allowed to mold myself into what I am today. So it's a double edged sword. It's been good, it's been difficult and I think in the long term it's been a blessing. I just don't fit in anywhere and people don't know how to manage me. But I realise because of that I've created my own projects and they've done well. Does that make sense? MARK: It does make sense, My colleague here who is - I think 49 next month – she said to me "I really wanted to be Toyah because she was the cool one". Were you aware back in the day that you were this person that they were trying to copy, emulate your style? MARK: And you've got two dates coming up in our area quite soon. St John Church in Farncombe – have you played there before? TOYAH: This is what I love about doing these acoustic shows – I get to see real places and we play what I call real venues. They're very small, they're very personal. Last week I did a tiny judge house in Otley up in Yorkshire and you'd think these are going to be tame and people just sit down and enjoy it … we had a stage invasion! (Mark laughs) These are very funny events because of the intimacy. With the acoustic show I tell stories but it is music led. It's me, two guitarists and we all sing. But people get up and they want to sing and they want to dance. It's fantastic! And tell me, where's the other place I'm playing in your area? MARK: Can't wait to see you in our neck of the woods, Toyah, great to catch up! TOYAH: Thank you so much Mark, great to talk to you! STEVE JORDAN: Good afternoon, Toyah Willcox! TOYAH: (on the phone) Hello! How are you doing? STEVE: I have a copy in front of me now and that crimsony pink that you talk about now – that's such an eye catching album cover. Really good! TOYAH: Well, it kind of came together by accident. 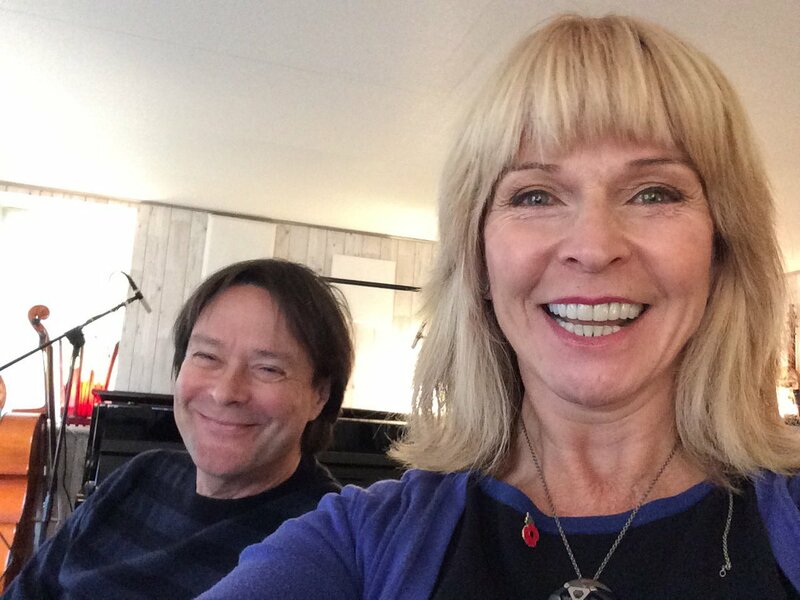 There's only two people on the album, myself an my co-writer Simon Darlow (below, with Toyah). People might not know Simon's name but he wrote “Slave To The Rhythm” for Grace Jones. So Simon and have been writing together, we're a songwriting team and we started writing when I was 19 and he was 17. So that was 1977 and about ten years ago we decided to start to write together again to see what would happen and our publishers just were over the moon. They said what we were delivering was just some of the best stuff they've ever heard. 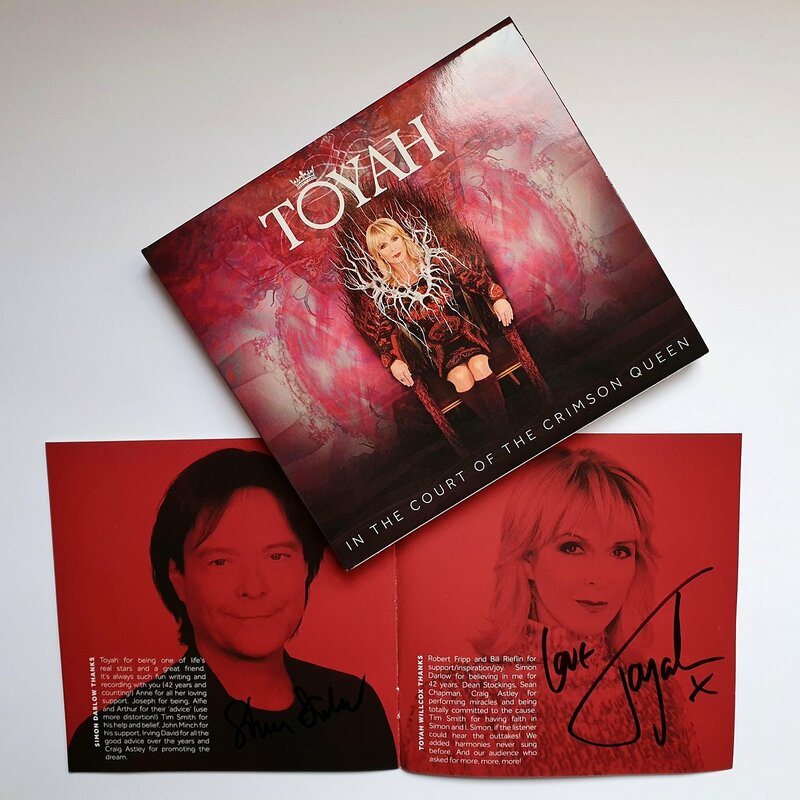 TOYAH: So this album “In The Court Of The Crimson Queen” has had a ten year journey and its been a phenomenal journey. Most of the songs have been in movies, the last song on the album “Our Hearts Still Beat” was the end song of a film called “In Extremis”. All of the songs have been used in a London musical called “Crime And Punishment”, which was out four years ago. TOYAH: And for me to be able to talk to you now, to have radio play I need to become a signed artist and Demon Records picked up on this and this is now an official release and to show how in demand it is - when they announced it two weeks ago I went to number one across the board in all the download charts. STEVE: So how have your musical tastes changed down the years then, because obviously people of my age will remember you as I described you earlier on, very bubbly, very smiley but in a way a rebellious singer with kind of rebellious songs. Has age calmed you down? TOYAH: No. I think my generation is always the punk generation, we're always rebels. We're the generation that forgot to grow old. But you asked me how have my musical tastes have changed and I'd actually say that they've kind of regressed. I'm so heavily appreciative of the Rolling Stones, of The Doors, of Tim Buckley, of Velvet Underground, Lou Reed. STEVE: Funny you should say that, I'm like you, Simon & Garfunkel are one of those as well that at the time I just did not appreciate what is was that I was playing and there's another one, I had to rediscover “Rumours” (By Fleetwood Mac) all for myself because a friend played to me when I was 19, my dad played to me when I was about 7,8,9 and I didn't really take it in. You listen to it again when you've grown a little and ah, it's completely different! TOYAH: Yeah. It's phenomenal and I think when you're a bit older you just understand the journey they had to make to get that music out and it just makes it such a complete picture. Back in the 70's artists really were artists, they lived the life and they were almost in self-destruct mode. STEVE: So which one can I play, Toyah? TOYAH: Well, “Dance In The Hurricane” is being reviewed as the best song of my life. It's quite long, it has an intro with my husband Robert Fripp on it, which I wrote, he's not playing on the album, he has nothing to do with the album but he's the narrator that opens the album. STEVE: It looked one of those programmes where they get the camera crew laughing always - got me as a kid and I realised there's no studio audience but he's making his friends in the room laugh, this is great! STEVE: - The day you realised you're going to be on and then what actually happened that day? STEVE: So all that bravado you showed as Toyah, the performer, you still had the nerves behind the make-up and the hair and the clothes? TOYAH: Yeah, I was on with all these other artists which I was in awe of. I think the first time I was on I was on with Adam Ant, Human League and a few other obviously well known people … Midge Ure … I was so in awe of them I didn't know how to communicate with them. That level of success was very new to me. STEVE: Wow! And then later on in the summer you'll be at the Rock and Bike Fest, South Normanton? TOYAH: Yay! What an introduction! Than you so much! ELERI: It's all you, it's all you Toyah! How are you? ELERI: I knew I'd seen it! You know when I was listening to it I thought I recognise this song! OK - right! Carry on! ELERI: Isn't that fantastic! That's the love the people have for you. You know, 42 years in the business it must be lovely to know that. But this also is fully endorsed by your husband, the King Crimson himself Robert Fripp! ELERI: So you don't do anything – you keep everything separate? ELERI: Even your bank balance? TOYAH: And it's introduced by Robert. That is Robert. ELERI: (laughs) Well, you know yourself! How much of this song is – so it's all purely about you and your path in life? TOYAH: I think it's about all our paths and this song “Dance In The Hurricane” can only be written from the perspective of my age. The whole album I wanted to be age appropriate but I'm still a punk rocker. I think we're the generation that forgot to grow old. We still want to dance, we still want joy in our life, we still want to party and we still want love and we all want to feel safe. 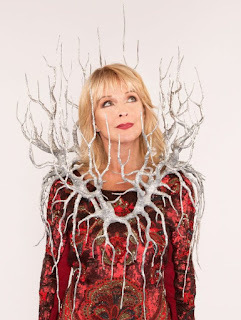 TOYAH: Well, “Sensational” is about all our empowerment and that's the present single. “Sensational” is – if we do not empower our children how can we expect the future to survive? ELERI: How much of a struggle has that been for you during your own life? To be accepted the way you are? ELERI: Like what? Tell us more about that? 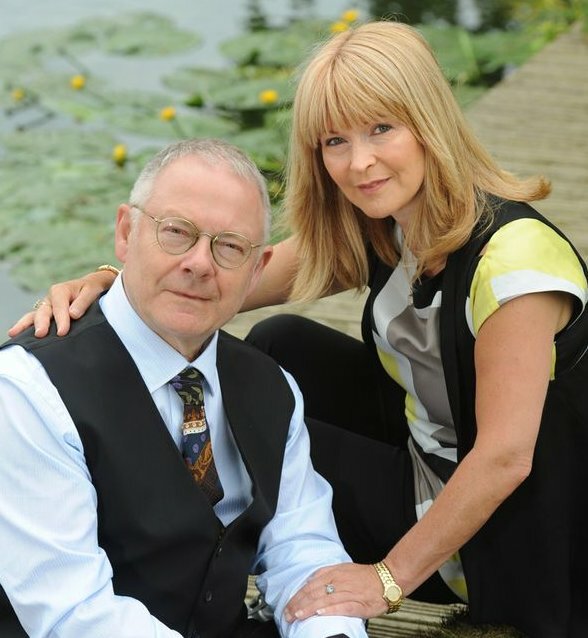 TOYAH: As an artist the only question I was ever asked was when was I going to have children? I found that incredibly offensive. Just because I was born a woman doesn't mean I decided to have children. It was a very difficult decade trying to be an artist because women are under huge problems to conform to everything to do with femininity. It wasn't the place I was in. I found that my forties were a joy! I think in her forties a woman is in her prime. You're sexually powerful, you've got much energy still. Fifties were good fun but so far sixties have been the best! ELERI: OK. I'll take Toyah's word for it! The album cover sees you all in crimson as well with an elaborate neck adornment. Your style, Toyah, has always been iconic, so have you always been in total control of your look? TOYAH: I have a very good team. The team have been with me for a good 20 years. I have a wonderful photographer Dean Stockings, who created all the computer graphics around the album cover as well as the “Sensational” video, which is just stunning. And my make-up artist Sean Chapman, who I also paint with, he created that wonderful piece that rests on my shoulders, which I've called The Fallen Crown. ELERI: Oh Toyah ... I think it's time for us to hear that brand new track of yours. ELERI: So I'm thinking … Do you fancy going back and tinkering with any of your other albums? I'm thinking “Anthem” now, from 1981 … Yeah? 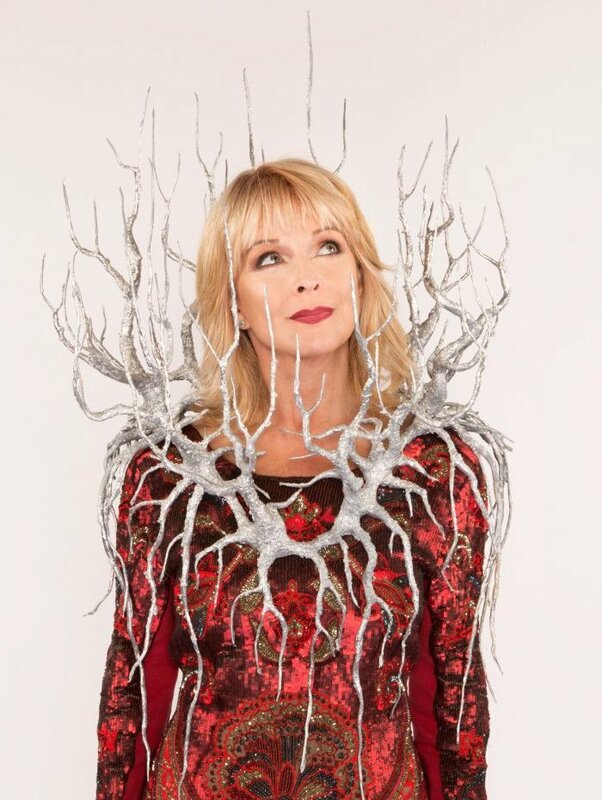 TOYAH: We'll get to “Anthem” … I actually think one of the most ground breaking albums that I've made and I've heard and I'm talking generally across the board as an artist here is “Sheep Farming In Barnet”. It's phenomenal. It's my first album, it breaks all the rules, it's so fresh today – I love performing it live. I would like to go back and really add a lot of technology to it, a lot of synthesisers, a lot of sequencing because I think it's still a mega album. “Anthem” was my first platinum album, it's a beautiful album. I think it's complete. Doesn't need touching. ELERI: Well, it gave us “I Want To Be Free” and “It's A Mystery” although “It's A Mystery” was on an earlier EP but how do you look back at that particular song? TOYAH: When I was first approached about it it was written by a friend of mine called Keith Hale. It was originally a kind of 12 minute vocal intro an something like a 28 minute instrumental that followed. My record company asked both Keith and I to turn it into a pop song format. I was very worried about it because up until that point I was championing being a really strong strident Boadicea type woman and I felt “It's A Mystery” it's just too vulnerable. But I compromised and we worked on it, I wrote the 2nd verse lyric. When it came out I was treading it, I really was treading the reaction. It went through the roof! ELERI: You're kidding me? So you were totally involved in all of that? Personally? TOYAH: I'm tenacious is probably a better way of saying it. TOYAH: Sometimes I have to accept no. You know if you go and phone up someone like “Killing Eve” and tell them I should be the lead in that series they're going to say no (Eleri laughs) So you know you have to just accept that. I self manage and it's hard work because it's very busy (laughs) – being the star and the manager are two full time jobs. ELERI: Well, you're career hasn't been just about music of course. You're acting, your CV in that department is pretty impressive. And also you've been involved in many social activities. Where does your social conscience stem from? ELERI: Another spectrum - “I'm A Celebrity” ("I'm A Celebrity, Get Me Out Of Here"). You said yes to that back in 2003. What was that experience like for you? ELERI: (laughs) Well, listen, you are going to be touring throughout this year, performing songs from the new album and 50 confirmed dates and festivals. Dublin, Bali, Belgium and Wales! TOYAH: Switzerland has gone in since as well – it's just adding and adding and adding! The whole year has gone crazy! ELERI: So how much time have you spent in Wales over the years then? ELERI: (laughs) You have no time, have you? ELERI: Listen, it's been lovely speaking to you, Toyah. You are still The High Priestess Of Punk or Punk Princess, which ever you prefer (Toyah laughs) All the very best and as usual it's been a pleasure! TOYAH: Fabulous to talk to you, thank you so much! "30th ANNIVERSARY OF THE CHANGELING"
21ST CENTURY TOYAH BY SEAN CHAPMAN"